The Vision of The Rocklin Historical Society is to create a sense of place where history engages, educates, entertains and inspires. We often hear that a reason people join our community is because of the “small town atmosphere”. The Rocklin Historical Society has particular interest, and, some would say, responsibility, relative to preservation of the heritage that contributes to our small town atmosphere. Attached is a vision for Old Town developed from the historical society’s perspective. The vision is intended to provide a focus and direction for the society’s activities. However, we have found that there is substantial interest on the part of the larger community in improvement of Old Town based on a theme anchored in the community’s heritage. Clearly there is much opportunity for improvement in Old Town – it is also imperative that the community act quickly if we are to preserve “at risk” structures and open space. By adopting and publicizing a vision we feel we can take advantage of the support that exists in the community. 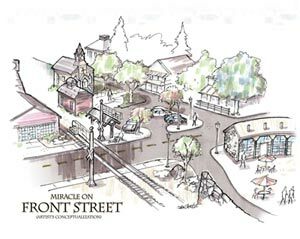 By partnering (City of Rocklin, service organizations and commercial interests) we can complete elements of the vision to improve old town and encourage viable commercial development that takes advantage of Rocklin’s rich heritage. We appreciate consideration of the elements of this vision for incorporation in the general plan. We also invite any suggestions that the committee or staff can make on the subject of a vision for Old Town.